A giant snail sculpture as part of the giant animal figures scattered around the Chilean capital of Santiago Chile (Chile). Oct. 25, 2018. 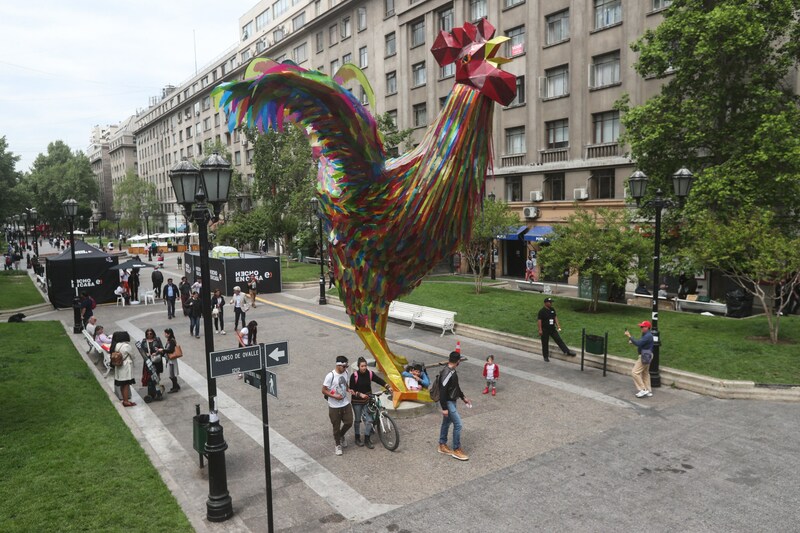 Residents of the Chilean capital awoke Thursday to the sight of giant animal figures that prompted startled pedestrians to snap photos of the unconventional artworks. It's all part of a festival whose aim, according to creative director Felipe Zegers, is "to show different ways to interact with the city." "Normally, we walk around the city day-to-day concentrating on our personal concerns and what this festival proposes, is that for the 11 days of the festival, those very spaces we occupy are transformed though creativity and art," he told EFE. There is likewise a message about the importance of protecting Chile's native wildlife and vegetation, he said, pointing to the figure of the Magellanic woodpecker. "Due to human action these birds have been migrating from the south of Chile to the city. This one has come to the city looking for a new home and it brings us this message that we should take care of our forests," Zegers said.